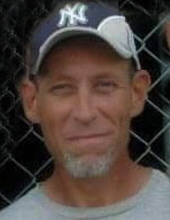 Age 50 of Owosso passed away Tuesday, January 22, 2019 at his home. Funeral Services will be held 1 pm Saturday, January 26, 2019 at Nelson-House Funeral Homes, Owosso Chapel with Kent Bolinger and Eric Krupp officiating. Burial will follow at Greenwood Cemetery. The family will receive friends at the funeral home on Saturday from 11am until the time of service. Michael was born October 30, 1968 in Owosso, the son of Albert and Virginia (Loftis) Krupp. He graduated from Owosso Public Schools, class of 1986, attended United Pentecostal Church and served in the United States Army. Michael had a love of history and a passion for German and WWII history. He was an avid fan of the Detroit Lions and the Yankees and loved all sports as well as collecting coins. Michael is survived by his sons, Jacob Krupp and Logan Krupp; daughter, Elizabeth Krupp; grandson Henrick Otto Krupp; parents Albert and Virginia; brothers Eric (Kassie) Krupp and Jason (Margaret) Krupp; nieces, nephews, aunts, uncles, cousins and other loving family members. To send flowers or a remembrance gift to the family of Michael J. Krupp, please visit our Tribute Store. "Email Address" would like to share the life celebration of Michael J. Krupp. Click on the "link" to go to share a favorite memory or leave a condolence message for the family.